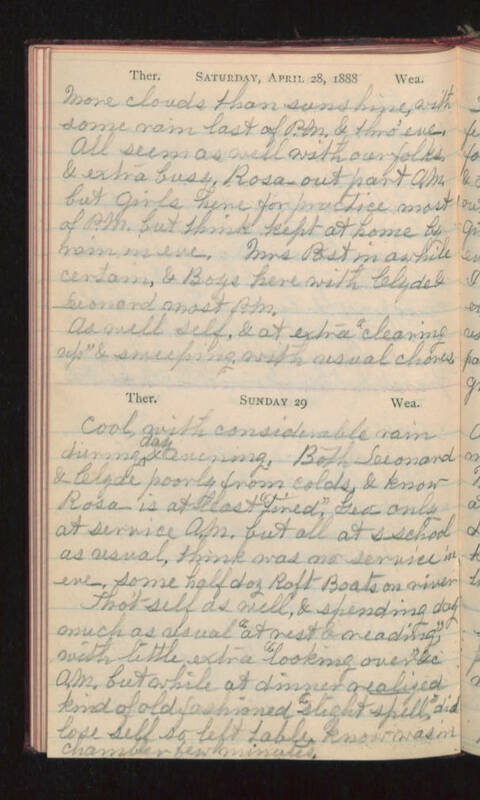 Saturday, April 28, 1888 More clouds than sunshine, with some rain last of P.M. & thro' eve. All seem as well with our folks & extra busy, Rosa- out part A.M. but girls here for practice most of P.M. but think kept at home by rain in eve. Mrs Post in awhile certain, & Boys here with Clyde & Leonard most P.M. As well self, & at extra "cleaning up" & sweeping with usual chores. Sunday 29 Cool, with considerable rain during day & evening. Both Leonard & Clyde poorly from colds, & know Rosa- is at least "tired". Geo- only at service A.M. but all at s-school as usual, think was no service in eve, some half doz Raft Boats on river. Tho't self as well, & spending day much as usual "at rest & reading", with little extra "looking over" &c A.M., but while at dinner realized kind of old fashioned "slight spell" did lose self so left table, know was in chamber few minutes.